Review: A drama about a straight-laced missionary and a gin-swilling riverboat captain. They find love while trying to escape in a dilapidated boat from a war-torn Africa during WWI. One of the first films to not be set in a studio. This was a huge deal at the time as it was completely unheard of.The difficulties with filming this film have been brilliantly documented by several books. The book talks mainly about how hard it was filming in Africa. There has been one written by Katharine Hepburn herself. During the filming Lauren Bacall went to Africa to be with her husband Humphrey Bogart and became life-long friends with Katharine Hepburn. This film is adapted from a novel by C.S. Forester. The author of the book wrote two different endings in his book. One was published in England and the other in America. The cinematography especially in this is just amazing. The scenery is just quite incredible. 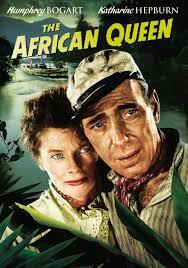 Very well directed by John Huston and an outstanding performance from Humphrey Bogart. The Assistant Director, Guy Hamilton went on to direct several James Bond films. The boat that they used for filming is now docked next to the Holiday Inn in Key Largo, Florida, just off US Highway 1. There were scenes in this where I found myself tensing up also at the same time finding it very exciting. Because the couple have come such a long way in the film at the end you so want them to have a happy ending. Originally this film was going to star John Mills and Bette Davis. A timeless classic that will always stand the test of time. At the Academy Awards in 1952 this won one Oscar and that was for Best Actor in a Leading Role (Humphrey Bogart). This apparently was the only Oscar that Humphrey Bogart ever received.